Game Technologies, the Poland-based company behind the little electronic die that is DICE+, has just announced a $99 developer edition that bundles a transparent-cased model along with its software development kit. 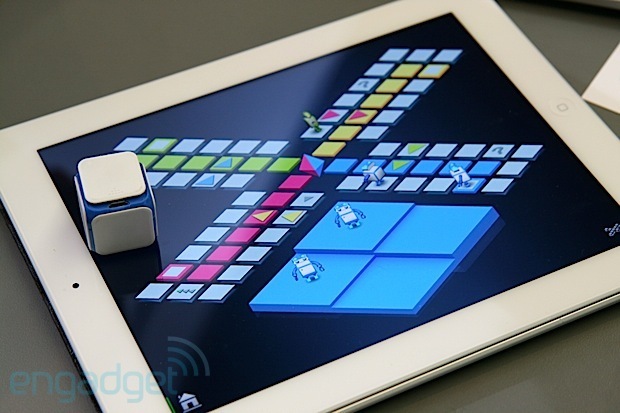 As a reminder, the DICE+ is an inch-sized rubberized cube packed with Bluetooth, an accelerometer and a rechargeable battery, with the aim of bringing human interaction to electronic board games and beyond. We had a look at a demo DICE+ here at the 2013 Game Developers Conference and it looks relatively unchanged from the one we saw at E3 last year. However, the microUSB port is now revealed via a sliding mechanism instead of a pull-out flap, which should result in a more balanced roll. Marketing director David Gatti also told us that the cube's internals have been revamped and simplified for more cost-effective production. An interesting aspect of the DICE+ is that it can be used as more than just a die; thanks to the aforementioned accelerometer, you can use it as a handheld controller for flight games for example. The cube is also touch-sensitive, and Gatti told us that devs could program different functions to taps and squeezes; you could squeeze it to fire at enemies while steering that plane if the game demands it. There are a couple of anti-cheat mechanisms as well -- the cube won't work when someone interacts with it before the roll is finished, and it needs to land on an even surface for it to register. The company wants nine of its own die-compatible games in iOS and Android app stores around DICE+'s August launch window -- Gatti told us that should be around GamesCom 2013, which goes from the 22nd of August to the 25th. Pre-orders for the consumer version are slated to start some time this summer and should go for around $40 retail. So if you're a developer and this intrigues you, go on and sign up for that dev kit with the source link below. As for the rest of us, we'd probably wait to see what sort of games are available for this before we take a gamble. The European company Game Technologies, who created DICE+, the first electronic dice, today announces it's officially launching its developer site http://developers.dicepl.us. The company is inviting game developers to create digital board games for tablets, and the Developer Pack is available for only US$99, including shipping worldwide. Game Technologies is also announcing that the customer version of DICE+ will be available for pre-order during Summer 2013. Following the level of interest from resellers and consumers at last year's E3, Game Technologies has been working behind the scenes over the past few months to seek further investment and increase its original production number from tens of thousands to half a million units. The new investor gave the company another big advantage: the possibility to build the production line in Europe. By doing so, Game Technologies will guarantee higher quality in its products. "We believe people are wired to play games in the company of each other. We can't just ignore 5,000 years of board games evolution – and now we know we can deliver this great experience to powered board games," said David Gatti, marketing and PR director at Game Technologies. ­ and yes, a thermometer. This is what Game Technologies aims to do in every product: get the latest technology available and create products that that are intuitive and easy to use. Any game developer can register at http://developers.dicepl.us and buy a Developer Kit. The package will hold a unique DICE+, but instead of the blue casing, developers will get a special transparent one as a thank you for supporting the technology.